DW-UHF-10kW RF Induction power supply, 4-turn helical inductor (coil) with 1.5” O.D. The testing was done in an open air atmosphere. A specially-designed, four turn helical inductor was used to provide optimal heating to the joint area. Initial tests were conducted with bare parts and temperature sensing paints to establish time-to-temperature and heating profiles. The BAg-24 brazing wire was shaped into preforms to fit the O.D of the straight tubing section. Black flux was also applied to both tubes. 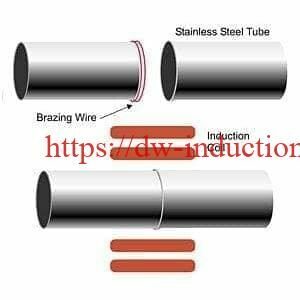 The two tube sections were then fit together with the braze preforms up against the flared tube section. 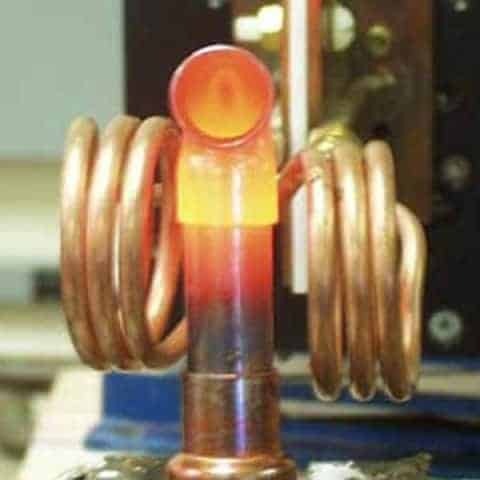 After RF power was applied for 18 seconds, braze wire reached a temperature of 1330°F. The wire then melted and flowed into the joint. RF power was maintained for another two seconds to ensure that all the braze wire melted. Consistent, repeatable results were achieved at 1330°F within 20 seconds. The braze wire melted and flowed evenly into the joint area.